Dawn graduated from Pacific Conservatory for the Performing Arts and holds a BFA in Dance and Theatre from the University of Utah. She is a level 1 Certified Music Together Teacher and has being instructing parents and children for 16 years. Being a drummer and dancer with Samba Fogo, the premier Brazilian performance band at The Utah Arts Alliance, feeds much of her personal growth musically and physically. When out of the studio and classroom, she is engaged with the physical, mental, and emotional development of her two children. Maria Jose comes from Costa Rica where she originally discovered her love for music. As a child, singing and music had become her passion when she took vocal and organ lessons. She discovered singing was what most impassioned her from the very beginning. She continued this passion through her school years in the choir, then in Honduras where she studied music. Being multi-talented, Maria Jose also holds a BA in Communications and Advertising for non-profit organizations. As a member of Rotary International she had the opportunity to give singing lessons to children at social risk, helping them develop their artistic skills. As a mother, Maria Jose discovered Music Together and is excited to have the opportunity to bring this international program to children and families in Salt Lake. 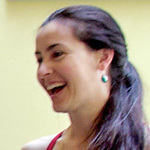 She is a registered Music Together® Teacher and has been instructing for 4 years.